Back last century when they used cabooses, what did they do with them when their days work was done? 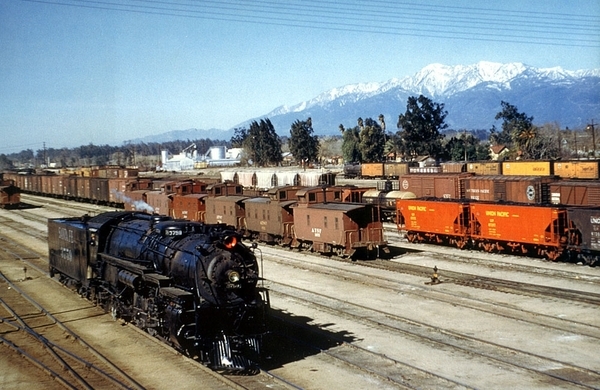 After a day on the road and they pull back into the yard, how long did the caboose/crew sit before the caboose was parked for the end of the shift, especially if cars they brought back into the yard had to be disconnected, stored, made up into an outgoing train? Were they left hanging out on some lonely piece of track until cars they brought in were taken care of, before the crew was truly finished with their work? Or was the priority to get them taken care of and off the time clock? I worked on the Penn Central one summer, and I remember that there was a caboose track. The track had several cabooses from the evening before, (in line), I assume, waiting for the yardmaster to designate a caboose for a specific train or crew. I loved the old wooden ones. They seemed to be set aside for yard crews only. I'm sure that there will be better answers to your question, but I wanted to reminisce a bit. Bob, When I started with Penn Central in 1974 the local crews used the N11 transfer cabooses and locked them up at the end of their shift. We in the car department had keys for those and were expected to service them with ice, water, fuel oil, and paper towels . One of these N11s had a recliner and an oriental rug on the floor. I attempted to throw out a moldy green stick of bologna that was in the ice box, and the conductor hollard at me and said it was still good. He would just cut the green part off! Hey it was his gut..... When I worked at Buckeye Yard we had a two track cabin track that held about two dozen cars, with a designated carman, a laborer, and an electrician on each shift. All of our cabooses were pool cars, so none were assigned to specific crews as before. We serviced as many cabins as the yardmaster required for that shifts out bound trains. It was tough some days to stay ahead of the yardmaster especially if we had several repairs due to hump damage or general wear and tear. Thanks guys. So I guess each (main?) yard had their own crew who sorted the cars out, while the crew that brought in the train and any cars gets some rest or goes home? I have to get a few more switches so I can add a caboose track to my yard! Realizing this is the Real Trains forum, here is some guidance from "The 10 Commandments of Model Railroading Yard Design": "Whether it's a double-ended siding or a stub, you need to have a place to store cabooses out of the way while classifying trains, but accessible enough to get to them fast. Usually the Caboose track is located off either the yard ladder, the yard lead or one of the A/D tracks. My personal favorite is off the A/D (where you are building or breaking a train anyway), but any easy to get to location will work. It's a great place to display all your caboose models too. If it is a stub track, make sure it is accessed easily from the yard lead and that it is from a facing-point turnout." Here is a diagram of a sample yard layout for a model railroad. Here is my layout's 1st stage (someday it will be finished). The cabin (PRR term for caboose) track is in lower center and circled. My runaround track is the one inside the loop. The runaround track allows a switch crew to remove the caboose from the train and set it out on a caboose track. Once the road engines and caboose have been cut off and are out of the way, the inbound train is ready for switching. The road crew have done their job and now the yard crews take over. A caboose was attached with the conductor away from terminal and at home. It was his responsibility to keep it clean and be sure maintainance was preformed as needed. In some cases ,the conductors actually stayed on the cab at a mine or outlying terminals without lodging. But most cases the caboose was cut off on the fly when the train was entering the final track and moved over to a cab track for storage until the conductor reported again for duty at away or home terminal. The "cabeese" pond. Great name. Here are mine after a hard days work. The grey/yellow work caboose is soon to enter the paint shop and come out yellow/grey. Who makes the cool detail stuff for a work caboose deck? Time to burn smoke fluid.